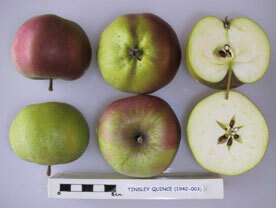 The Tinsley Quince apple variety was received by the National Fruit Trials in 1942 from R. Fairman, Crawley. It is currently cultivated as part of Brighton Permaculture Trust’s -:- National Collection in Stanmer Park, Brighton. You can see a Tinsley Quince apple tree (planted 2009) in Home Farm Orchard, Stanmer Park ( map). The Tinsley Quince apple has a quince-like smell when ripe. The flesh is sweet and firm. The fruit is greenish-yellow with a few russet dots and is slightly greasy. It is flat to rectangular in shape and ribbed slightly on the body of the fruit and at the eye. The fruit can be picked in early October and stored till November. The Tinsley Quince tree is moderately vigorous and forms a spreading canopy of branches.